My fellow Nephalem, as stated above the time draws closer to the end of the current season. With a few days to go, Blizzard's periodic patch also occurs in-between Seasons. For the benefit of our regular players, I'm going to go through some of the exciting bits that this patch will bring. Before we jump into that, let's have a quick look at what content we have recently experienced. Kanai's Cube, which has the most significant impact on power creep. A specific set layout zone tailored for a specific set. You'll need to discover the location of the dungeon through cryptic clues (or Google) and attempt to complete the goal's listed. Not only does it allow you to master the set but it teaches you how to play the set as it was designed. Also, damage numbers are compacted to display 10M instead of 10,000,000. A welcome quality-of-life change! Your top damage numbers are also colored in Orange instead of Yellow. Finally, we get an additional tab immediately when we start Patch 2.4. You can earn more via completing Seasons 5's Seasonal Journey. Previously on Consoles only, Action Combat keeps you trying to keep those kills going to gain more XP with a little visual of a rope burning in the middle bottom of the screen. Destructibles, destroy more, move faster. It doesn't stack but refreshes the duration when you destroy more of them. Revamped and New Legendaries... as expected. 50 of them! But who uses those? Aren't they useless compared to Set Legendaries? Blizzard has a way of turning these previously useless Sets on their heads in a spectacular fashion. This might be the biggest game changer of the game! Since it's release the leaderboards (or the most efficient way to farm) has been dominated by players wearing Set Legendaries. The power of sets vary between Seasons/Patches and that hasn't changed at all since the game's release... until now. Players on the PTR, for the first time have been experimenting how this Non-Set Rings Set in combination with non-set Ancient Legendaries are able to compete on the leaderboards. Gives you additional main stat (here 3 x Emeralds were used). The amount of stat depends on the rank of the Legendary Gem used. It's 5 stat per rank of gem, so a Rank 53 Leg Gem = 265 Stat, a Rank 70 Gem = 350 Stat! 10 Ancients with 10 x 70 L.Gem upgrades = 3500 Stat! On the PTR, the leaderboards are quite similar across the board with all 6 classes, hovering around high 70s and even 80s with the Crusader leading the pack with a Bombardment build using the Legacy of Nightmares. 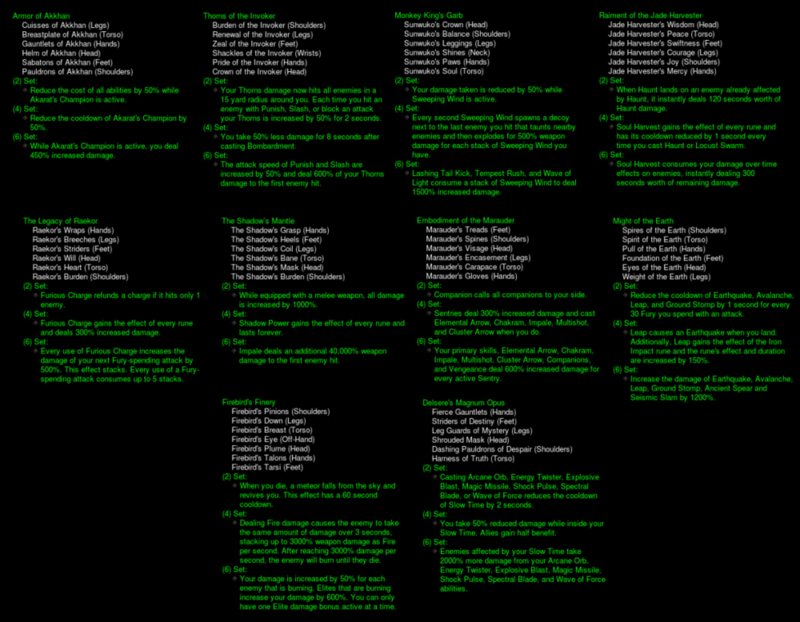 With all this in mind, I absolutely cannot wait for Patch 2.4 to arrive any sooner in early January. This is Don Wu signing off, and until next time. Keep calm and keep farming! Want to discuss more? Join us right now at #diablo on our Discord server!